Sri Lankan security personnel walk past dead bodies covered with blankets amid blast debris at St. Anthony’s Shrine following an explosion in the church in Kochchikade in Colombo on April 21, 2019. On Easter Sunday, Islamic suicide bombers detonated in three churches and three hotels in Sri Lanka, killing over 300 local Christians and Western tourists, maiming 500 more, and providing influential Westerners an opportunity to distance themselves from Christians. Easter or “Ēostre” is an Old English word denoting an ancient Indo-European goddess after whom the month now called April was named by the Anglo-Saxons. Most European languages derive their word for the Easter season from the Greek word Πάσχα (Paska), which was borrowed from either the Aramaic or Hebrew words for Passover. Thus, the description of the murdered Sri Lankan Christians obscures their belief in the divinity of Jesus Christ and gives a nightmarish impression that they worshipped the Anglo-Saxon goddess of the dawn. Dreher brought attention to an article in Washington Post, which strove to give the impression that only European “right-wing” populists like Marine LePen and American conservatives believe that Christians, one of the most persecuted minority groups in the world, are singled out for attack. “Some” to Taylor and Noack means Le Pen, Germany’s “far-right” Alternative for Germany, unnamed “far-right groups”, British journalist “and provocateur” Katie Hopkins, Frank Gaffney “a former Reagan administration aide now best known for his anti-Muslim rhetoric”, and Trump supporters writing on Reddit. To add ignorance to injury, the authors described Easter as one of the most important dates in the Christian calendar. It is, in fact, the most important date in the liturgical year. “When things like the Sri Lanka attacks happen, the first thing that many American and British journalists think is, ‘Oh dear, this is going to cause a spike in Islamophobia,’” Dreher wrote. Two of the churches, St. Sebastian’s Catholic Church in Negombo and St. Anthony’s Shrine in Colombo, were Roman Catholic. The third, Zion Evangelical Church in Batticaloa, belongs to the Reformed tradition. Dreher added that the Post’s indifferent attitude to Muslim-on-Christian violence could inspire angry people to join “far right” movements. “If media outlets like the Washington Post make it seem like a right wing thing, or a far-right wing thing, to notice — and to get angry about the fact — that Muslim terrorists blew hundreds of Christians to bits while they were in church on the holiest day of the Christian year — then the Post is doing the work of radicalizing people to the far right,” he wrote. Writing in the Catholic Herald, C.C. Pecknold suggested that Western elites were reluctant to recognize the murdered Christians as martyrs because they are attempting “to shed” liberalism’s Christian past. 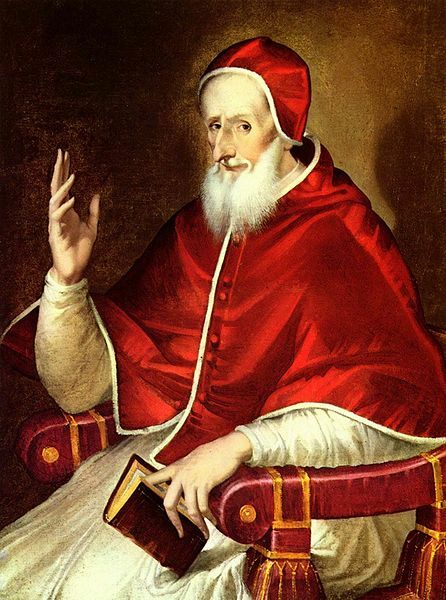 “…[L]iberalism is premised on the conceit that it brought an end to “religious violence,” and ushered in peace between all (mostly protestant) religious views,” Pecknold wrote. “John Locke even seems to envision a sort of Pax Christiana that makes the secular state an neutral agent of Christian unity, and so makes martyrs a thing of the past. So long as liberalism was built on the basis of a (mostly protestant) Christian culture, this claim looked somewhat plausible,” he continued. In contrast to the discomfort of American politicians and journalists to address anti-Christian sentiment among Islamic radicals, Carl Anderson, the CEO and Supreme Knight of the US-based Knights of Columbus spoke frankly. “The Knights of Columbus stands in solidarity with our Christian brothers and sisters in Sri Lanka during this time of trial,” Anderson wrote in an online statement. “Terrorist attacks like those on Easter Sunday are the acts of those who reject the sanctity of life, human rights and religious freedom. In addition to our prayers, the Knights of Columbus is sending $100,000 to Cardinal Ranjith in Colombo, Sri Lanka‌, for his use in the rebuilding and repair of his Christian community in the aftermath of this act of terrorism,” Anderson continued. New Culture Forum recently co-hosted a conference on the shamefully untold story of the persecution of Christians and other religious minorities. Easter Sunday’s horrific attacks in Sri Lanka must concentrate minds around the world on these #InvisibleVictims. One of the keynote speakers was Damian Thompson, Editor-in-Chief of the Catholic Herald and Associate Editor at The Spectator. The Catholic Herald was so shocked by the stories at the conference that it immediately announced it would focus its energies on this issue. By coincidence Damian Thompson is this week’s guest of NCF’s episode of “So What You’re Saying Is…”, where he discusses this very subject. In a clear desire to target Christians once again, Satan’s agents have unwittingly made martyrs of hundreds more innocents, who with Easter joy, were celebrating the Resurrection of the Lord. Shortly before 9 a.m. (local time), explosions were detonated during Easter Mass at Catholic churches in the Sri Lankan capital, Colombo, and in Negombo, a city 20 miles to its north. At the same time, a bomb exploded at a service at the evangelical Zion church in Batticaolo, on Sri Lanka’s east coast. The image above is the powerful witness of an age: our own time, in which God wished us to live. 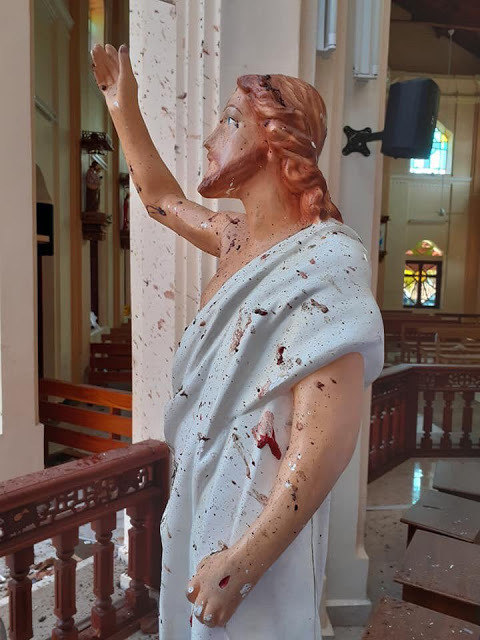 It is a statue of the Risen Lord, sprinkled with the blood of Martyrs killed on this Easter Sunday by terrorist explosions against Catholic churches in Sri Lanka. Over 150 dead so far, and scores of injured, in these churches filled with Catholics joyfully celebrating the greatest of Feasts, and in other targets in the country. We know that these Holy Martyrs are in heaven with Our Lord and all His Saints right now. We know that they were welcomed by the Most Holy Trinity with immense jubilation: they gave their blood for Christ. They joined their blood with the Holy Blood of the Lord. They know God fully now, they see Him face to face, they will rise again in the end of time, for life eternal. And yet, we know that so many families in the Catholic communities of Sri Lanka will be changed forever by this heinous attack! So many mothers without children, so many children without parents, so many families without their main breadwinners that may fall into great poverty and need! May Our Risen Lord have mercy upon them! May Our Blessed Mother cover them with her mantle! May their Martyred family members intercede for them, so that they will be strengthened in the certainty of the Resurrection of the Flesh and of Everlasting Life with the Lord Jesus Christ! 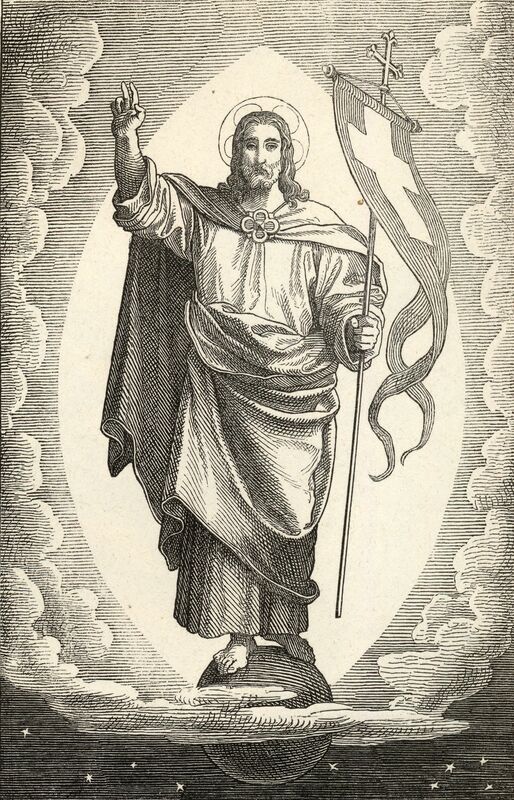 This week, in place of the regular Pastor’s Column from Fr George W. Rutler, we share the Paschal joy of the Hieratikon (Catechetical Sermon) of Saint John Chrysostom. Let no one grieve at his poverty, for the universal kingdom has been revealed. Let no one mourn that he has fallen again and again; for forgiveness has risen from the grave. Let no one fear death, for the Death of Our Saviour has set us free. He has destroyed it by enduring it. Hell was in an uproar because it was done away with. It was in an uproar because it is mocked. It was in an uproar, for it is destroyed. It is in an uproar, for it is annihilated. It is in an uproar, for it is now made captive. Hell took a body, and discovered God. It took earth, and encountered Heaven. It took what it saw, and was overcome by what it did not see. O death, where is thy sting? O Hades, where is thy victory? Christ is Risen, and you, O death, are annihilated! Christ is Risen, and the evil ones are cast down! Christ is Risen, and the angels rejoice! Christ is Risen, and life is liberated! Christ is Risen, and the tomb is emptied of its dead; for Christ having risen from the dead, is become the first-fruits of those who have fallen asleep. Go in spirit to our Lord’s sepulchre. It is early in the morning; a hallowed silence rests on all around. 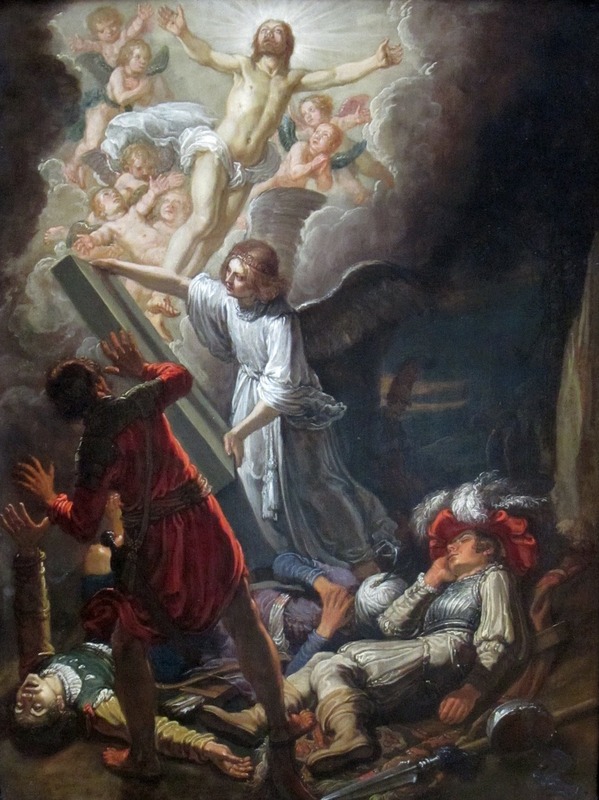 The sepulchre wherein the body of Jesus reposes is securely closed by the heavy stone; it is guarded by soldiers who perhaps at the dawn of this the third day after His death recall with derision the prediction of the crucified One that He would rise again on the third day. That day has come now, but no sign of any change appears; the sepulchre remains just the same as it was yesterday and the day before, undis­turbed, unaltered. Externally all is at rest, but behind the stone, within the tomb, the repose is not unbroken. 1st. Consider that our Lord’s soul has just left Limbo, and accompanied by the holy patriarchs, has re­turned to the sepulchre, to be reunited to the sacred remains deposited there. There the body lies, wrapped in linen cloths, rigid and lifeless. What, think you, must the feelings of those devout patriarchs have been when they saw the price at which their redemption was purchased, when they gazed upon the dead body of our Lord, when they beheld it to be one vast wound, crimsoned with blood, marked with five large, gaping wounds, on hands and feet and side! Well may we suppose them to have been stimulated by this spectacle to give thanks anew to the Lord for the redemption He accomplished with so much suffering, the awful cost of which this sepulchre now reveals to them. Yet while they gazed in sorrow on the mournful sight the sacred body of Christ presented, all was speedily to be changed, and a wondrous and joyful transition to take place. 2d. Consider the complete transformation our Lord’s body underwent when the soul was reunited to it. All the disfigurement, all the stains and scars vanished in an instant; the defaced and mangled body is suddenly clothed with light and shines with greater brilliance than when transfigured on Thabor. Rigid and motionless a moment before, it suddenly becomes translucent, subtle, ethereal, endowed with immortality and with celestial splendor. The sacred wounds have not however disap­peared; nay, on our Lord’s glorified body they shine like stars and sparkle like precious stones, and the risen Saviour will ever retain them as a perpetual memorial of the redemption He accomplished. Here behold, my soul, an image, an earnest of your own resurrection. This body of yours which perhaps is now so unlovely, so defaced and deformed, so tortured by aches and pains, will one day shine with the radiance of the noon-day sun, will gleam as brightly as the morning star; but, be it observed, this will only be the case if it bears the marks not of transgressions and iniquities, but of those graces and virtues which flow from the five wounds of the glorified body of Christ, our risen Lord. Rejoice with them, my soul; let your alleluia rise up to Heaven, resounding out of the depths of a heart overflowing with joy and gladness; and let this day be nothing else but one long canticle of pious, joyous praise and thanksgiving to the glory of Him who on the third day rose again from the dead! On the Blessed Virgin at our Lord’s Sepulchre. Imagine, my soul, that you are contemplating the holy Mother of our Lord standing beside the sepulchre of her divine Son. See how, before the massive block of stone closes the entrance for ever, she casts one more fond, lingering look on His beloved remains, a look in which grief and love are mingled; once more she bedews His countenance with her tears and takes a final, sad farewell of the Son of her love. Impress the image of the mourning Mother of God upon your mind and keep it before your eyes during your meditation. 1st. Consider with what feelings Mary gazed upon the dead body of Jesus. She saw before her the body of her Son, supernaturally conceived without stain by the operation of the Holy Ghost, flesh of her flesh, the life of her life, the sacred vessel fashioned in her pure womb by the overshadowing from on high, now bereft of all beauty, of all form, bereft of the soul that animated it, subjected to the laws of nature which He Himself established, maltreated, defaced by the men for whose redemption He took this form upon Him, by them mangled and slain. Alas! how pallid are His cheeks, how sunken His eyes; there is no beauty left in that fair virginal body! O sorrowing Mother! words fail to describe the grief of this last look at the lifeless form of thy Son. Yet, my soul, are you aware that there is a sight still more grievous in Mary’s eyes than this? It is when she is compelled to see the sacred body of our Lord laid in the grave of a heart unprepared to receive Him worthily, as perhaps she will have to do on the Easter festival to-morrow. 3d. Consider that Mary’s only consolation after the burial of her Son was to visit the places hallowed by His sufferings and His death. 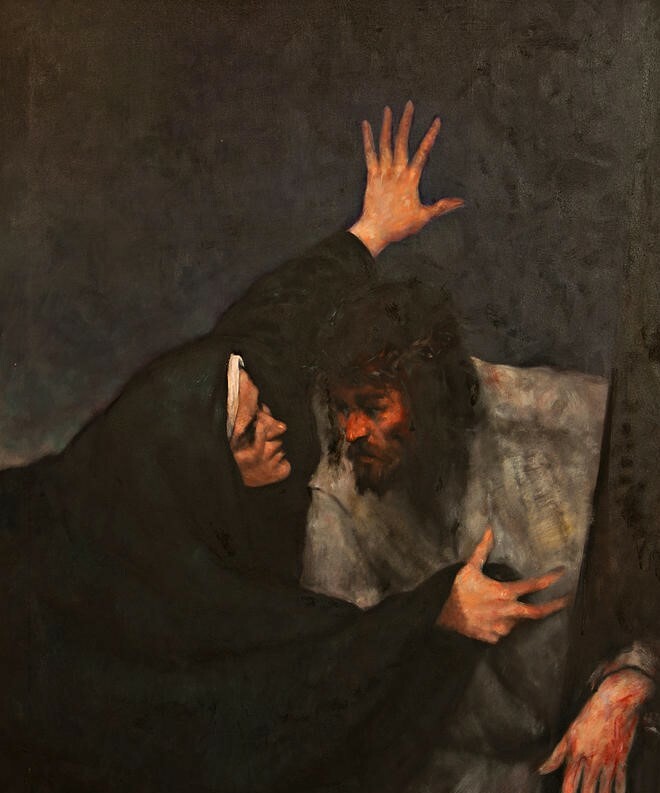 Imagine the devotion where with the lonely, forsaken Mother, left behind in her solitude, followed on the way of her Son’s Passion, the way of the cross. Imagine the ardent affection that glowed within her heart as she climbed the steep of Calvary, the loving, pious tears that fell from her eyes on to the ground which her divine Son had moistened with His sweat of blood in the hour of His agony. Already, my soul, the alleluias of Easter sound in your ears; the feast is quickly approaching, the season of joy, and other subjects of a less sorrowful nature will be the theme of your meditations. Yet learn of Mary from henceforth to visit from time to time the scene of our Lord’s Passion; reflect at what moment and in what manner you will in future recall to mind His sacred Passion, and make a special resolution at least once in every week to follow with Mary the way of the cross. The procession of the Crucifixion was headed by a trumpeter, who sounded his trumpet at every street corner and proclaimed the execution. Some paces behind him came a crowd of boys and other rude fel­lows, carrying drink, cords, nails, wedges, and bas­kets of tools of all kinds, while sturdy servant men bore poles, ladders, and the trunks belonging to the crosses of the thieves. The crown of thorns, which it was impossible to leave on during the carriage of the cross, was taken from Christ’s head and placed on the end of a pole, which this lad now carried over his shoulder. And next came Our Lord and Redeemer, bowed down under the heavy weight of the cross, bruised, torn with scourges, exhausted, and tottering. Since the Last Supper of the preceding evening, without food, drink, and sleep, under continual ill-treatment that might of itself have ended in death, consumed by loss of blood, wounds, fever, thirst, and unutter­able interior pain and horror, Jesus walked with tot­tering steps, His back bent low, His feet naked and bleeding. With His right hand He grasped the heavy load on His right shoulder, and with the left He wearily tried to raise the flowing garment constantly impeding His uncertain steps. The four execution­ers held at some distance the cords fastened to His fetter girdle. The two in front dragged Him forward, while the two behind urged Him on. In this way He was not sure of one step, and the tugging cords con­stantly prevented His lifting His robe. His hands were bruised and swollen from the cords that had tightly bound them, His face was covered with blood and swellings, His hair and beard were torn and matted with blood, the burden He carried and the fetters pressed the coarse woolen garment into the wounds of His body and the wool stuck fast to those that had been reopened by the tearing off of His clothes. Jeers and malicious words resounded on all sides. He looked unspeakably wretched and tormented, though lovingly resigned. His lips moved in prayer, His glance was supplicating, forgiving, and suffering. The two executioners behind Him, who held up the end of the cross by means of ropes fastened to it, increased the toil of Jesus, for they jerked the ropes or let them lie slack, thus moving His burden from side to side. The procession was flanked by soldiers bearing lances. Then did the Divine Cross-bearer fall full length on the ground by the projecting stone, His burden at His side. The drivers, with curses, pulled Him and kicked Him. This brought the procession to a halt, and a tumult arose around Jesus. In vain did He stretch out His hand for someone to help Him. With the aid of supernatural help, Jesus raised His head, and the terrible, the diabolical wretches, instead of alleviating His sufferings, put the crown of thorns again upon Him. When at last, with all kinds of ill-treatment, they dragged Him up again, they laid the cross once more upon His shoul­der. And now with the greatest difficulty He had to hang His poor head, racked with thorns, to one side in order to be able to carry His heavy load on His shoulder, for the crown was broad. From His sunken eyes full of blood He cast, from under the tangled and twisted thorns of His crown, frightful to behold, a look full of earnest ten­derness upon His afflicted Mother, and for the sec­ond time tottered under the weight of the cross and sank on His hands and knees to the ground. The most sorrowful Mother, in vehemence of her love and anguish, saw neither soldiers nor executioners-saw only her beloved, suffering, maltreated Son. Wring­ing her hands, she sprang over the couple of steps between the gateway and the executioners in advance, and rushing to Jesus, fell on her knees with her arms around Him. 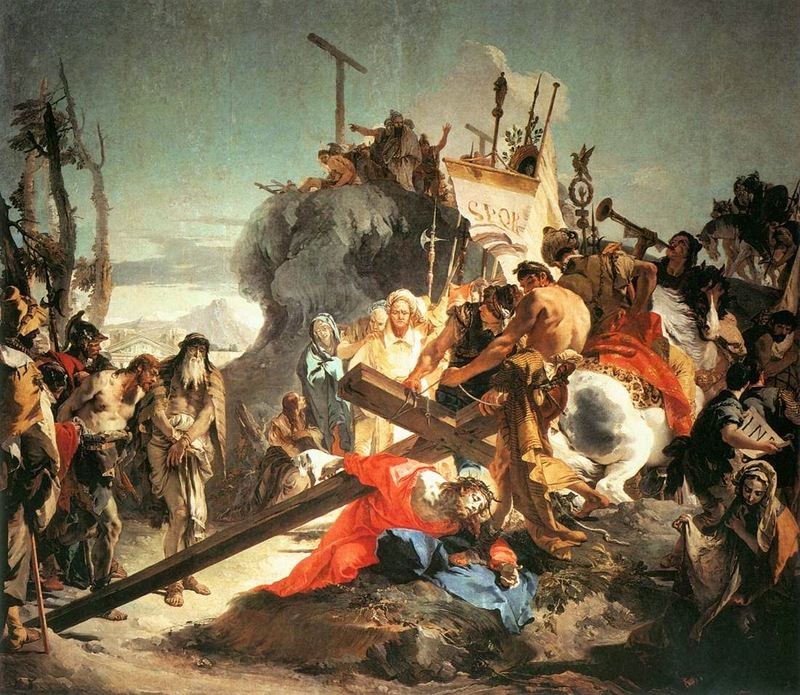 It was about a quarter to twelve when Jesus, laden with the cross, was dragged into the place of execu­tion, thrown on the ground, and Simon driven off. The executioners then pulled Jesus up by the cords, took the sections of the cross apart, and put them together again in proper form. Ah! How sad and mis­erable, what a terribly lacerated, pale and blood­stained figure was that of poor Jesus as He stood on that place of martyrdom! And now the executioners tore from Our Lord the mantle they had flung around His shoulders. There stood the Son of Man, trembling in every limb, covered with blood and welts; covered with wounds, some closed, some bleeding; covered with scars and bruises! He still retained the short woolen scapular over His breast and back, and the tunic about His loins. The wool of the scapular was dried fast in His wounds and cemented with blood into the new and deep one made by the heavy cross upon His shoulder. This last wound caused Jesus unspeakable suffering. The scapular was now torn ruthlessly from His frightfully lacerated and swollen breast. 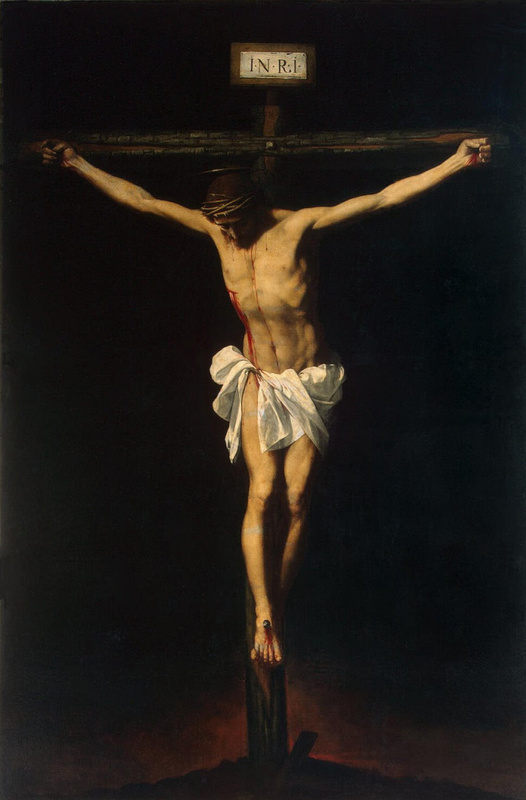 His shoulder and back were torn to the bone, the white wool of the scapular adhering to the crusts of His wounds and the dried blood on His breast. 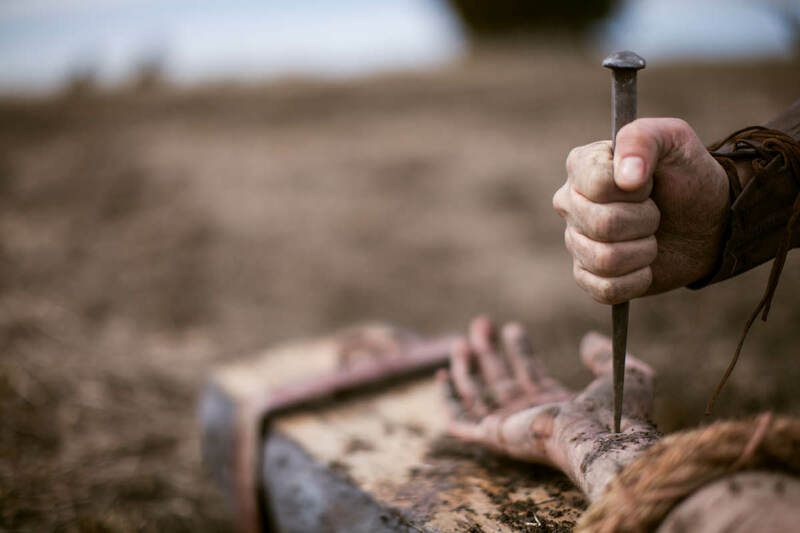 Jesus was now stretched on the cross by the execu­tioners, He had lain Himself upon it; but they pushed Him lower down into the hollow places, rudely drew His right hand to the hole for the nail in the right arm of the cross, and tied His wrist fast. One knelt on His sacred breast and held the closing hand flat; another placed the long, thick nail, which had been filed to a sharp point, upon the palm of His sacred hand, and struck furious blows with the iron ham­mer. A sweet, clear, spasmodic cry of anguish broke from the Lord’s lips, and His blood spurted out upon the arms of the executioners. The muscles and liga­ments of the hand had been torn and, by the three edged nail, driven into the narrow hole. I counted the strokes of the hammer, but my anguish made me forget their number. The Blessed Virgin sobbed in a low voice, but Magdalen was perfectly crazed. Several of the executioners, by means of these ropes, lifted the cross upright, while others supported it with blocks around the trunk, and guided the foot to the hole prepared for it. They shoved the top somewhat forward, until it came into a perpen­dicular line, and its whole weight with a tremulous thud shot down into the hole. The cross vibrated under the shock. Jesus moaned aloud. Loving hands were anxiously stretched forth as if to help the Holy of Holies, the Bridegroom of souls, nailed alive to the cross, quivering on high in the hands of raging sinners. But when the upraised cross fell with a loud crash into the hole prepared for it, a moment of deep silence ensued. It seemed as if a new feeling, one never before experienced, fell upon every heart. Hell itself felt with terror the shock of the falling cross. Our Lord’s sacred body presented upon the cross an appearance at once noble and touching. Yes, the Son of God, the Eternal sacrificing Himself in time, was beautiful, holy, and pure in the shattered body of the dying Paschal Lamb laden with the sins of the whole human race. The hour of the Lord was now come. He was strug­gling with death, and a cold sweat burst out on every limb. John was standing by the cross and wiping Jesus’ feet with his handkerchief. Magdalen, utterly crushed with grief, was leaning at the back of the cross. The Blessed Virgin, supported in the arms of Mary Cleophas and Salome, was standing between Jesus and the cross of the good thief, her gaze fixed upon her dying Son. Jesus spoke: “It is consummated!” and raising His head He cried with a loud voice: “Father, into Thy hands I commend My Spirit!” The sweet, loud cry rang through Heaven and earth. Then He bowed His head and gave up the ghost. On the Burial of Our Lord. Picture to yourself the mournful procession which today wends its way from the summit of Calvary down to the garden belonging to Joseph of Arimathea. Nicodemus and Joseph, assisted by the disciple whom Jesus loved, are carrying our Lord’s sacred and precious body to the tomb; they are followed by His heartbroken Mother, Mary, the most bereaved, the most to be pitied of all the mothers in Israel; they are followed by Magdalen, dissolved in tears of bitter grief, and the devout women sorrowing sore, close the melancholy funeral procession! But that is not all; the angels of God, unseen by human eye, are present; they witness the burial of their Creator. In spirit join the company of mourners, accompany them to the sepulchre wherein your Lord was laid, and meditate upon this solemn scene. 1st. His sepulchre is in a garden. It was in a garden that the sentence of death was passed upon the human race, hence He who took the condemnation upon Himself was buried in a garden. The fall of man took place, his destitution commenced in a garden, and to-day his restitution is accomplished in a garden. It was in a garden that the first Adam, by his prevarication, closed the portals of heaven against his posterity; and it was whilst His body rested in a garden that the second Adam, descending to Limbo, opened the gates of heaven to all believers. Betake yourself therefore with feelings of profound gratitude to the sepulchre of our Lord to-day; and if your heart is to be a spiritual tomb wherein our Lord in the Blessed Sacrament will rest, O spare no pains that this grave may be in a garden, a garden filled with fair flowers and the choice fruits of good works, fragrant with the perfume of your virtues. Is this so with you, or is our Lord’s spiritual grave in a desert instead of in a garden? 3d. Finally it is a stranger’s grave in which Jesus is laid. Behold He to whom the Heavens and the earth belong, He who created all things, who upholds all things, who governs all things, has nothing that He can call His own at His death any more than He had during His life. He lived as a stranger upon earth and as a stranger He died. So true and faithful was Jesus in His love of poverty. He was born in a stable, He sojourned in a dwelling that was not His own, He died upon the cross, and now He is interred in the monument of another. Betake yourself to-day, my soul, with a thankful heart to our Lord’s sepulchre; there renew your vow of voluntary poverty, the poverty which He observed so perfectly unto His life’s end; and if your heart is to be a spiritual grave wherein He is to be laid, let it be the grave of a stranger; see that you always feel yourself a stranger, an alien here below;. do not ever make earth your home; let not your heart cling to earthly things, but ever look and long for heavenly things; know that as soon as the Christian—still more the Religious—begins to feel really comfortable and at ease upon earth, then he may be sure that he has not the right spirit, he is not in the right dispositions. Bestir yourself then, my soul; see that you prepare a spiritual tomb for our Lord within your breast; a grave that is like a garden, that is new, that is the grave of a stranger upon earth; then you will have every reason to hope that the grave of your mortal body shall, like that of our Lord, be glorious. From the onset I have hoped that the burning of the Cathedral of Notre-Dame will “spark” the Faith in Paris and in France. And I don’t think that it is a mere “coincidence” that the famous church burned. It may have been a construction machine glitch or it may have been a human act or it may have been the act of a human, but, as Chesterton observed, coincidences are God’s puns. These events mean something. At Crisis today there is a thoughtful piece by William Kilpatrick about the fire. A couple of points. I really like the quote from Flannery O’Conner. In the Bible, the destruction of a city or a temple is often linked to immorality or unbelief. The fire and brimstone that was rained down on Sodom was punishment for the sins of its people. Likewise, Jesus warned the people of Capernaum and other cities that their fate could be worse than Sodom’s because they did not repent despite the “mighty works” he had performed in their midst (Matt. 11:20-24). When Jesus wept over the city of Jerusalem, he prophesied that its enemies “will not leave one stone upon another in you, because you did not know the time of your visitation” (Luke 19:41-44). The “sign” of Notre Dame ablaze comes on top of other disturbing signs. Since the beginning of the year, dozens of churches in France have been vandalized, desecrated, and torched. In 2018, 1063 attacks on Christian Churches or symbols were registered in France—a 17 percent increase over 2017 when “only” 878 attacks were registered. Other signs that the times are out of joint are not hard to find. Among the more horrific were the massacre at the office of the Charlie Hebdo publishers, the Bataclan Theatre attack, the truck jihad in Nice, and the Christmas Market massacre in Strasbourg. Church desecrations and terror attacks are not confined to France, but since France is one of the most aggressively secular states in Europe, it may be more in need of signs than most. And it may require more spectacular signs to call France—once considered the “eldest daughter of the Church”—back to the faith. When asked why her stories were full of grotesque characters and shocking violence, Flannery O’Connor replied: “When you write for the blind, you have to write in big letters.” Those who live in overly-secularized societies, such as France, often become blinded to what is truly important in life, and may, therefore, require fiery signs to wake them up to reality. The truth is that unbelief in France is probably as great as, if not greater, than in the Biblical cities and towns cited in Christ’s warning to the unrepentant. Only four percent of French Catholics attend Sunday Mass on a regular basis, and in the larger cathedrals, the number of tourists far exceeds the number of worshippers. After visiting several Churches in France, including Notre Dame, Mark Steyn was struck by their emptiness: “One gets the sense that a living, breathing faith is just becoming, actually, a museum, an art gallery, a storage facility.” The cathedrals of Europe are truly magnificent and awe-inspiring, but the awe is for achievements that we no longer seem capable of because we lack the requisite faith. The damage to Notre Dame is a wakeup call not only for Christians who have let their faith lapse, but also for dyed-in-the-wool secularists. I’ll add an observation. For a while now I’ve written about my own experiences in Paris. I’ve gotten to Paris one or two times a year now for several years after a long hiatus of visiting the City of Lights. I’ve noticed, over the last few years in Paris, that the churches have gone from being closed and dirty to open more often and being cleaned. The lights are on and people more are praying in them. I’ve seen the Blessed Sacrament exposed more often. Also, I think that the revival of the Traditional Mass is playing a part. How could it not? And attacks, especially by Islamic terrorists are on the rise. We must not forget that we are involved in a war on many levels, including the spiritual. The Devil and his demons have human agents. They will not be idle in the face of the revival of the Faith. They will not be idle in the provocation – through signs – of their pawns. God permits evils and brings glory from them. Don’t forget, during your Triduum observances, to pray to the angels of France and to the Mother of God to help the awakening of Faith in the people of that ancient core of Christendom. The Blessing of the Holy Oils. The second Mass which used, formerly, to be said on Maundy Thursday, was that of the Blessing of the Holy Oils. This holy function, which takes place but once each year, requires a Bishop as the consecrator. For now many centuries, this great ceremony is celebrated at the single Mass, which is said, on this day, in commemoration of our Lord’s Supper. As this Blessing only takes place in Cathedral Churches, we will not enter into each detail; and yet we would not deprive our readers of what they ought to know with regard to the Holy Oils. Faith teaches us, that, as we are regenerated by water, so are we confirmed and fortified by oil; and that Oil is one of the chief elements chosen by the Divine Author of the Sacraments, whereby to signify and produce grace in our souls. The reason of the Church’s selecting Maundy Thursday for the Blessing of the Holy Oils, was that they would be so much needed for the Baptism of the neophytes on Easter Eve. It behoves the Faithful to understand the mystery of those sacred elements. We will, therefore, briefly explain it to them, in order that we may excite their hearts to gratitude to our Blessed Lord, who has made material things the instruments of grace, and, by his Blood, has given them the sacramental power which resides within them. The noblest of the three Oils is the Chrism, and its consecration is more solemn, and fuller of mystery, than those of the other two. It is by the chrism that the Holy Ghost imprints his indelible seal on the Christian, that has already been made a member of Christ by Baptism. The Water gives us our spiritual birth; the Chrism gives us strength; and, until such time as we have received its holy anointing, we have not as yet the perfect character of a Christian. Anointed with this holy Oil, the Faithful has a visible sign given him of his being a member of the Man-God, whose name of Christ signifies the unction he has received both as King and Pontiff. This consecration of a Christian by Chrism is so much in accordance with the spirit of our holy Religion, that, immediately after Baptism, the child receives upon its head an anointing, (though it is not a sacramental one,) of this Oil, to show that he is already a sharer of the kingly character of Jesus Christ. In order to express, by an outward sign, the sacredness of Chrism, an Apostolic tradition requires the Bishop to mix Balm with it. This Balm represents what the Apostle calls the good odour of Christ, of whom it is written: We will run after Thee, to the odour of Thy ointments. The scarcity and high price of other perfumes has obliged the Latin Church to be content with Balm alone in the mixture of holy Chrism: but in the Eastern Church, where the climate is more favourable than ours, three and thirty species of precious perfumes are put into the Oil, and it thus becomes an ointment of exquisite fragrance. The holy Chrism, besides its sacramental use in Confirmation, and its being put upon the head of the newly baptised, is also used by the Church in the consecration of her Bishops, in the consecration of Chalices and Altars, in the blessing of Bells, and in the Dedication of a Church, in which last most imposing ceremony, the Bishop pours out the Chrism on the twelve crosses, which are to attest to all succeeding ages, the glory of God’s House. The third of the holy Oils is that which is called the Oil of Catechumens. Though it be not the matter of any Sacrament, it is, nevertheless, an Apostolic institution. Its blessing is less solemn than that of the Chrism, but more so than that of the Oil of the Sick. The Oil of Catechumens is used in the ceremonies of Baptism, for the anointing the breast and shoulders. It is also used for the anointing a Priest’s hands in Ordination, and for the coronation of a King or Queen. These few words of explanation will give the Faithful some idea of the importance of the Blessing of the holy Oils. By this threefold Blessing, says St. Fortunatus, (in the beautiful Hymn, which is used during the ceremony,) the Bishop acquits the debt he owes, and which none but he can pay. We beseech thee, O Lord, send forth from heaven Thy Holy Spirit the Paraclete upon this rich juice of the olive, which Thou hast graciously produced from the green wood, for the solace of both mind and body. By Thy holy blessing, may all they that are anointed with this ointment of heavenly virtue, receive help to mind and body; may it remove from them all pains, all infirmities, and all sickness of mind and body, for it was with oil that Thou didst anoint Thy Priests, Kings, Prophets, and Martyrs. May this, being blessed by Thee, O Lord, become unto us an ointment of perfection, and abide within our whole being. In the name of our Lord Jesus Christ. One of the seven Subdeacons then carries the phial back, and the Bishop returns to the Altar, and continues the Mass. As soon as he has given Holy Communion to the Clergy, he returns to the place prepared for the blessing of the Oils. The twelve Priests, the seven Deacons, and the seven Subdeacons, repair to the place where the other two phials have been put. One contains the oil, which is to become the Chrism of salvation; the other, the oil which is to be sanctified as the oil of Catechumens. The procession is soon seen returning towards the Pontiff. The two phials are carried by two Deacons; a Subdeacon carries the vase of Balm. The Bishop begins by blessing the Balm: he calls it “the fragrant tear of dry bark,—the oozing of a favoured branch, that gives us the priestly unction.” Before proceeding to bless the oil of the Chrism, he thrice breathes upon it, in the form of a cross. The twelve Priests do the same. The Gospel tells us that our Blessed Saviour used this same ceremony over his Apostles. It signifies the power of the Holy Ghost, and expresses His name, which is The Spirit. This Holy Spirit is about to make this oil become an instrument of His Divine power. The Bishop first prepares it for the heavenly dignity, by exorcising it. He then celebrates the praises of the Chrism, by this magnificent Preface, which has been handed down to us from the earliest ages of our faith. It is truly meet and just, right and available to salvation, that we should always, and in all places, give thanks to Thee, O Holy Lord, Almighty Father, Eternal God: who, in the beginning, among the rest of Thy bounteous gifts, didst command the earth to yield fruit-bearing trees, among which should be the olive, which produces this most rich liquor, and whose fruit was to serve for the making holy Chrism. Hence it was, that David, foreknowing, by a prophetic spirit, the Sacraments of Thy grace, sang that our faces were to be made glad with oil: and when the sins of the world were expiated of old, by the deluge, a dove announced that peace was restored to the earth, by bearing an olive branch, the type of the gift to come, which has been manifested in these latter ages; for after the waters of Baptism have washed away the sins of men, this anointing of oil gave us joy and calm. Hence, too, Thou didst command Thy servant Moses to ordain his brother Aaron priest, by pouring oil upon him, after he had been cleansed with water. A greater honour still was, that when Thy Son, our Lord Jesus Christ, bade John baptise Him in the waters of the Jordan, Thou didst send upon Him the Holy Ghost in the form of a dove; that thus by a voice that bore testimony, Thou mightest designate Thine Only Begotten Son, in whom Thou wast well pleased, and mightest prove, beyond all doubt, that this was the fulfilment of what the Prophet David had foretold, when he sang, that he was to be anointed with the oil of gladness above his fellows. “We, therefore, beseech Thee, Holy Lord, Almighty Father, Eternal God, through the same Jesus Christ, Thy Son, our Lord, that Thou vouchsafe to sanctify, by thy blessing, this thy creature oil, and infuse into it the virtue of the Holy Ghost, through the co-operating power of Christ, Thy Son, from Whose name it hath borrowed its own of Chrism, and wherewith Thou didst anoint the Priests, Kings, Prophets, and Martyrs. Raise this Chrism into a Sacrament of perfect salvation and life, to them that are to be renewed by the spiritual laver of Baptism. That thus, the corruption of their first birth being absorbed by the infusion of this holy anointing, they may become a holy temple, redolent with the fragrance of the innocence of holy living. According to what Thou hast appointed in this mystery, bestow upon them the honour of kings, priests, and prophets, by vesting them in the robe of incorruption. May this oil be to them, that are born again from water and the Holy Ghost, a Chrism of salvation, making them partakers of life everlasting, and co-heirs of heavenly glory. The Bishop then takes the Balm; and having mixed it, on a paten, with a little oil, he pours it into the Phial. The consecration of the Chrism thus completed, he salutes it with these words: Hail, O Holy Chrism! This he does with the intention of honouring the Holy Ghost, Who is to work by this sacramental oil. The same is done by each of the twelve Priests. O God, the rewarder of every spiritual increase and growth! Who strengthenest the beginnings of weakly souls by the power of the Holy Ghost: we beseech Thee, O Lord, that Thou vouchsafe to pour out Thy blessing upon this oil, and grant to them, that come to the laver of holy regeneration, the cleansing of soul and body, by the anointing they receive from this Thy creature; that so, if there should be any stains fixed upon them by their spiritual enemies, they may be effaced by the touch of this holy oil. May the wicked spirits find no room there; may the powers, that have been put to flight, have no further sway; may there be no lurking place left to insidious evil ones. May Thy servants that come to the faith, and are to be cleansed by the operation of Thy Holy Spirit, find in this anointing a preparation for that salvation, which they are to receive in the Sacrament of Baptism, by the Birth of a heavenly regeneration. Through our Lord Jesus Christ, thy Son, Who is to come to judge the living, and the dead, and the world by fire. Amen. The Bishop then salutes the Oil, on which he has conferred these wonderful prerogatives, saying: Hail, O holy Oil! The same act of reverence is repeated by each of the Priests. One of the deacons takes the Chrism, an other the Oil of Catechumens, and a procession is again formed for taking them to the place prepared for them. They are covered with veils of silk;—the holy Chrism, with white: the Oil of Catechumens, with purple. We will conclude our outline of this imposing ceremony, by giving our readers the beautiful Hymn, composed in the 6th century, by St. Venantius Fortunatus, Bishop of Poitiers. The Church has adopted it for the two processions, which we have already described. emblem of the gift of peace. debt, by consecrating the Chrism. life, that breaks the demon’s power. is healed by the same. brow is anointed with this oil. The extensive fire that tore through Notre Dame Cathedral in Paris on Monday is a sign of the “spiritual conflagration” that has ripped through the Catholic Church in the past fifty years, Bishop Athanasius Schneider has said. The destruction is a “symbolic and evocative” sign of “what happened in the life of the Church” in recent decades, he says, as people have “witnessed a conflagration of the Church’s most precious spiritual masterpieces” — her liturgy, faith and moral life, especially among priests. In his comments, Bishop Schneider makes no conclusions about the cause of the Notre Dame fire but places it in context of the series of arson attacks perpetrated against Catholic churches in the last year. Elaborating on the tragedy’s “stirring” message, he identifies as the “spiritual arsonists” in the Church the members of the “liberal” establishment of heterodox theologians and clergy who have contributed to the crisis in the Church or who refuse to address its root causes. 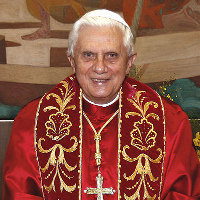 Many among their ranks, he notes, now regard Benedict XVI as a “troublemaker” for obstructing their “incendiary work,” through his recent essay. According to the auxiliary of Astana, it is also a call to the entire Church to do penance for the spiritual conflagration that has ripped through the Church in the past fifty years. 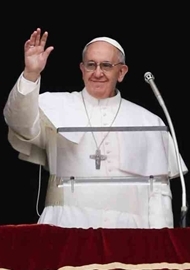 “Penance and reparation must also be made for the betrayal of Christ’s explicit command to evangelize all nations without exception,” including the “Jewish” and “Muslim” people, he adds. Bishop Schneider expresses his hope that the Notre Dame fire might “rekindle” in the Shepherds of the Church a “love and zeal” for the Catholic Faith and an ardent desire to evangelize all people. Here below is the full text of Bishop Athanasius Schneider’s comments to LifeSite on the Notre Dame Cathedral fire. The lightning vehemence with which fire engulfed the Cathedral of Notre Dame in Paris left one with the impression that an unexpected event had come like a bolt from out of the blue. And yet, viewed as a phenomenon, this tragedy came after a series of hundreds of systematic arson attacks on various sacred objects belonging to the Catholic Church in France over the last year. It is also significant that the fire in Notre Dame occurred at the beginning of Holy Week, which is the heart of the liturgical year for all Catholics. As the facts in the case are still unknown, we have no evidence on which to base allegations of a plot to destroy the cathedral. Yet one is left with a queasy feeling inside, especially as one considers the chain of systematic anti-Catholic events, marginalization, discrimination and ridicule which the Catholic Faith has undergone at the hands of the French political establishment and French media landscape, both of which are firmly in the hands of the current anti-Christian and Free Masonic powers in France. Notre Dame is not only the most symbolic cultural and religious sign for the Catholic Church in France. Given that France bears the title “eldest daughter of the Church,” her main cathedral also has deep cultural and religious significance for the entire Catholic world. The destruction of a visible sign of such vast proportion as the Cathedral Notre Dame in Paris also contains an unmistakable spiritual message. The fire of Notre Dame is without doubt a powerful and stirring sign which God is giving to His Church in our day. It is a cri de coeur for authentic conversion, first and foremost among the Shepherds of the Church. The fire has largely destroyed Notre Dame, a centuries-old masterpiece of the Catholic Faith. This is a symbolic and highly evocative representation of what has happened in the life of the Church over the last fifty years, as people have witnessed a conflagration of the Church’s most precious spiritual masterpieces, i.e., the integrity and beauty of the Catholic Faith, the Catholic liturgy and Catholic moral life, especially among priests. The climax of this decades-long spiritual conflagrationhas manifested itself in the clerical sexual abuse scandals which have profoundly shaken the entire Church. Sadly, we must say that the handling of the clerical sexual abuse scandal has remained more or less on the level of emotional dismay. The true roots of this crisis have not been transparently disclosed, nor, consequently, have effective spiritual medicine and peremptory canonical norms been applied. In a recent and detailed essay, the former Pope Benedict XVI identified one of the most important roots of the abuse crisis, i.e. the loss of the true Faith, the prevalence of moral relativism, and the heterodox and unspiritual formation of seminarians. In reactions to the statement of the former Pope Benedict XVI one could observe an embarrassed silence — and even some indignant outcries — rumbling throughout the ranks of the establishment of liberal theologians and liberal clergy, who are the true spiritual arsonists in the Church today. They now consider the former Pope Benedict XVI to be a troublemaker whose blunt observations obstruct their incendiary work. The tragic conflagration of the Cathedral of Notre Dame in Paris is also a propitious occasion for all members of the Church to do penance for the acts of betrayal that have been committed against Christ and His Divine teachings in the life of the Church over the past fifty years. Penance and reparation must be made, especially for the betrayal of the command of God the Father that all mankind should believe in His Divine Son, the only Savior of mankind. For God wills positively only the one and unique religion which believes that His Incarnated Son is God and the only Savior of mankind. Penance and reparation must also be made for the betrayal of Christ’s explicit command to evangelize all nations without exception, first among them the Jewish people. For it was to them that Christ first sent His Apostles, to bring them to faith in Him and to the New and Everlasting Covenant for which the Old and temporary Covenant was established. May the fire at the Cathedral of Notre Dame in Paris, however sad and deplorable it is, rekindle — especially in the Shepherds of the Church — a love and zeal for the true Catholic Faith and for the ardent evangelization of all those who do not yet believe in Christ. And may they be mindful not to marginalize and cowardly exclude the Jewish and Muslim people from this outstanding form of charity. May the fire at Notre Dame also serve as a means to inflame in the Shepherds of the Church a spirit of true repentance, so that God might grant to all the grace of a renewal in the true Faith and in true love for Christ, Our Lord, Our God and Our Savior. When the Cathedral of Notre Dame in Paris began to burn, there was a group of faithful, with children and young people among them, who knelt on the ground and sang the Hail Mary. This was one of the most touching and spiritually powerful signs in the midst of a great tragedy. May Our Lady, Help of Christians, intercede for us, that the Shepherds of the Church might begin, with the help of the lay faithful, to rebuild the spiritual ruins in the life of the Church in our day. In the Church, as in Paris, a process of repairing and rebuilding is a sign of hope. “Hold the cross high that I might see it through the flames“ – St Joan of Arc. 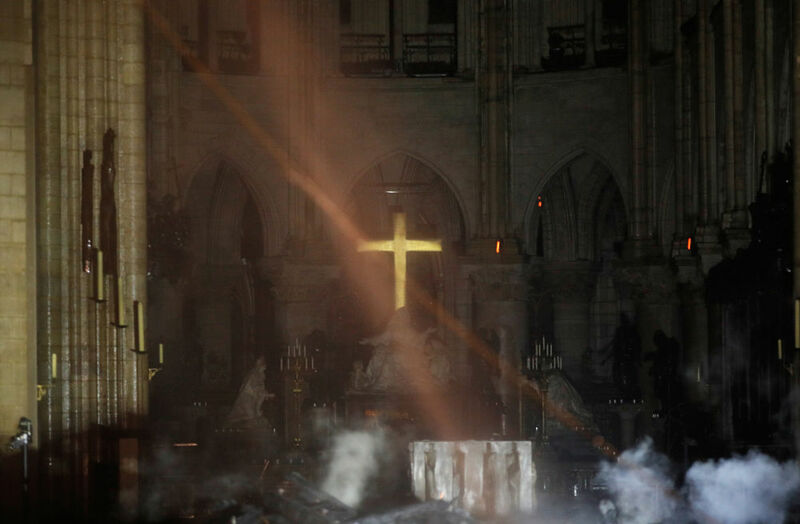 Powerful image shows Cross shining through the smoldering wreckage at Notre Dame. This RTV Short uses happier images from Remnant Tours in Paris to pay homage to Our Lady’s cathedral, which [on Monday] was engulfed in flames so completely that many thought she would surely burn to the ground. Evidently, Our Lady had other ideas. After Parisians watched her burn, rosaries in hand last evening, they awoke this morning to find the old Cathedral miraculously still standing, the Crown of Thornes rescued, the famous rose windows, pieta and organ saved. The Godless world had looked on in horror as one of Catholicism’s most important symbols went up in smoke and, incredibly, they wept. Why? Could it be that the Catholic Faith, also in flames, is nevertheless still something modern men instinctively know the world cannot live without, even though so many have abandoned it? If Notre Dame in flames was a metaphor for the modern Church in flames, is the promise to rebuild not also a metaphor for what’s to come, as the Novus Ordo breathes its last? After all, the ‘butcher block’ table altar at Notre Dame was crushed beneath the weight of the falling spire, while the old high altar stood virtually untouched. If you’re looking for a sign, look no further. Notre Dame still stands today as she’s stood for nearly a thousand years. And as long as she continues to stand with her glorious angels, craggy old gargoyles and magnificent flying buttresses there to remind the world of what we once were and what we can become again if we turn back to God — there’s hope. Notre Dame, priez pour nous. The Chief Priests and the Ancients of the people are met to-day, in one of the rooms adjoining the Temple, for the purpose of deliberating on the best means of putting Jesus to death. Several plans are discussed. Would it be prudent to lay hands upon him at this season of the Feast of the Pasch, when the City is filled with strangers, who have received a favourable impression of Jesus from the solemn ovation given to him three days back? Then, too, are there not a great number of the inhabitants of Jerusalem, who took part in that triumph, and whose enthusiastic admiration of Jesus might excite them to rise up in his defence? These considerations persuade them not to have recourse to any violent measure, at least for the present, as a sedition among the people might be the consequence, and its promoters, even were they to escape being ill-treated by the people, would be brought before the tribunal of the Roman Governor, Pontius Pilate. They, therefore, come to the resolution of letting the Feast pass quietly over, before apprehending Jesus. But these blood-thirsty men are making all these calculations as though they were the masters. They are, if they will, shrewd assassins, who put off their murder to a more convenient day: but the Divine decrees,—which, from all eternity, have prepared a Sacrifice for the world’s salvation,—have fixed this very year’s Pasch as the day of the Sacrifice, and, to-morrow evening, the holy City will re-echo with the trumpets, which proclaim the opening of the Feast. The figurative Lamb is now to make way for the true one; the Pasch of this year will substitute the reality for the type; and Jesus’ Blood, shed by the hands of wicked priests, is soon to flow simultaneously with that of victims, which have only been hitherto acceptable to God, because they prefigured the Sacrifice of Calvary. The Jewish priesthood is about to be its own executioner, by immolating Him, whose Blood is to abrogate the Ancient Alliance, and perpetuate the New one. But how are Jesus’ enemies to get possession of their divine Victim, so as to avoid a disturbance in the city? There is only one plan that could succeed, and they have not thought of it: it is treachery. Just at the close of their deliberations, they are told that one of Jesus’ Disciples seeks admission. They admit him, and he says to them: What will you give me, and I will deliver him unto you? They are delighted at this proposition: and yet, how is it, that they, doctors of the law, forget that this infamous bargain between themselves and Judas has all been foretold by David, in the 108th Psalm? They know the Scriptures from beginning to end;—how comes it, that they forget the words of the Prophet, who even mentions the sum of thirty pieces of silver. Judas asks them what they will give him; and they give him thirty pieces of silver! All is arranged: to-morrow, Jesus will be in Jerusalem, eating the Pasch with his Disciples. In the evening, he will go, as usual, to the Garden on Mount Olivet. But how shall they, who are sent to seize him, be able to distinguish him from his disciples? Judas will lead the way; he will show them which is Jesus, by going up to him and kissing him! The Church commences her chants with one to the glory of the Holy Name of Jesus, outraged as it is, on this day, by them that plot His death. This Name, which was given Him by heaven, and signifies that He is our Saviour, is now being blasphemed by His enemies: in a few hours, their crime will bring its full meaning before us, for His Death will have worked the Salvation of the world. At the name of Jesus every knee should bow, of those that are in heaven, on earth, and under the earth; because the Lord became obedient unto death, even the death of the cross: therefore the Lord Jesus Christ is in the glory of God the Father. Ps. O Lord, hear my prayer, and let my cry come unto Thee. In the first Collect, the Church acknowledges to God, that her children have sinned against Him: but she reminds Him of the Passion, endured for their sakes, by His Only Begotten Son; and this revives her hope. Grant, we beseech Thee, O Almighty God, that we, who continually are punished for our excesses, may be delivered by the Passion of Thy Only Begotten Son. There is an interesting piece at Breitbart today about the rescue of relics and important objects from Notre-Dame Cathedral as the roof burned. They formed a human chain inside the cathedral. Notre-Dame Treasures, Relics Saved After Firefighter-Priest Led Human Chain Inside Burning Cathedral. The chaplain to the Parisian fire brigade has been hailed as a hero after it was revealed he led efforts to save the priceless holy relics and art stored inside Notre-Dame Cathedral. The story of Father Jean-Marc Fournier was reported by Christian journalist of French Catholic Television station KTOTV, who revealed the chaplain went into the burning cathedral to retrieve relics and art before they could be damaged by fire and falling debris. Reports state the priest formed a human chain to carry the items away from danger. The priest also served as a chaplain to the French army and survived an ambush in Afghanistan where ten French soldiers were killed. Television network Sky News reports the remarks of one member of the Paris emergency services who said of the chaplain: “Father Fournier is an absolute hero. Among the relics saved in the effort was Notre-Dame’s most famous and revered and holy relic, the gold-encrusted Crown of Thorns, believed to be the wreath of thorns that was placed on the head of Jesus Christ at his crucifixion. That the relic was saved flashed around the world on Monday evening, but news of further items saved emerged Tuesday morning. 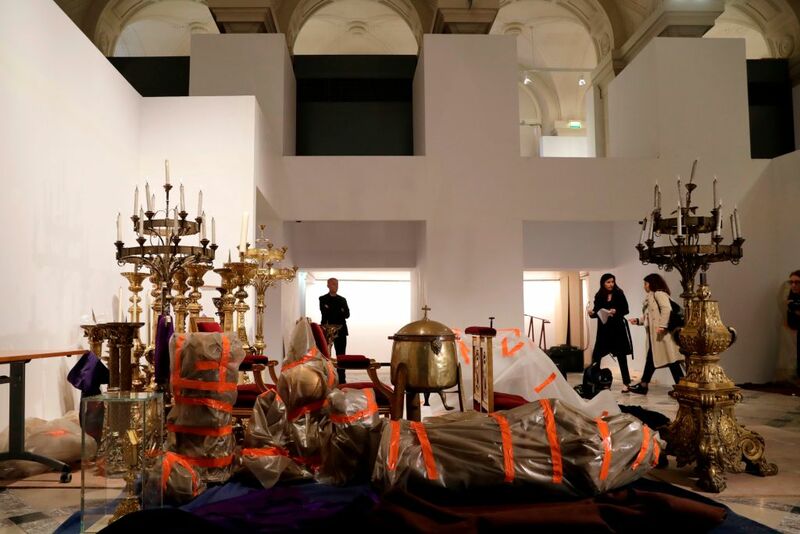 Many of the objects removed from the Cathedral were bundled up in packaging and placed in Paris’s city hall. 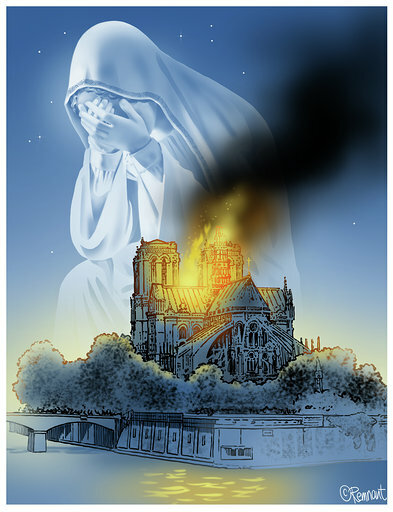 Other works of art associated with Notre-Dame had already been removed from the Cathedral before the fire even started. The 16 copper statues of the apostles and evangelists that adorned the roof of Notre-Dame made headlines last week as they were removed by crane for restoration work, intended to go two at a time over the course of the coming years. They now stand on palettes in a warehouse, having been saved from the fire which the restoration work, ironically, seems to have started.